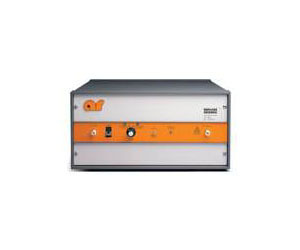 The Model 50WD1000 is a portable, self-contained, air-cooled, broadband, solid state amplifier designed for applications where extensive bandwidth and high gain are required. Push-pull circuitry is utilized in all of the high power stages in the interest of lowering distortion and improving stability. The Model 50WD1000 covers the frequency range from D.C. to 1000MHz in two bands. The low band covers from D.C. to 0.5MHz. The high band covers from 0.5MHz to 1000MHz. These bands can be selected automatically, manually or by remote control through the remote connector. The 50WD1000, when used with an RF sweep generator, will provide a minimum of 50 watts of swept power. Provisions are included for the remote control of the basic operating functions of the amplifier. Computer control can be accomplished using our CP2001 or CP3000 accessories.